Congruent is one of the early adopters of Microsoft Dynamics CRM, practicing it since version 1.0. Our experienced CRM consultants, together with our adept offshore CRM development and customization team, provide users with pioneering & enhanced technical solutions according to their business demands. For over a decade, we have been the go-to partner for our clients to meet their Dynamics CRM implementation, upgrade & customization needs that are specific to their requirements. At Congruent, we possess a team that is technically very strong and competent in performing customizations and development on Dynamics CRM to suit the needs of the business. Our developers and consultants have been working with Dynamics CRM since version 1.0 and the fact that they keep themselves updated to all the technological changes that have developed with every new version makes them a dependable team. 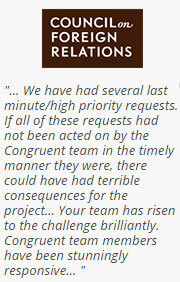 Congruent specializes not just in implementing CRM systems but also provide the required support from thereon. We have been providing continuous support and maintenance services to our customers for a decade. Our certified developers are also experienced in supporting implementations done by other companies and our experience of rescuing failed projects and implementations comes in handy. Congruent, as a CRM partner also works with ISVs in building solutions over Dynamics CRM. Our strong offshore CRM development center acts as a virtual team for many of the ISVs in North America and Australia. We can build add-ins that can seamlessly integrate with Dynamics CRM or act standalone. Customer was storing data in documents and papers and had a demand for an enterprise level scalable application.Congruent implemented CRM as an enterprise level application to handle complete data and process and customized CRM to enhance the business operations. We would be happy to help you with any queries and requirements that you might have in Dynamics CRM. Kindly write to us using the enquiry form to know more about our Dynamics CRM service offerings and how we could be of help to you.